Nusa Penida (Indonesia) (AFP) – Millions of tourists are drawn to Bali’s palm-fringed scenery and rich marine life, but there is a danger lurking beneath its famously crystal-clear waters: a wasteland of plastic rubbish. An underwater video shot by British diver Rich Horner this week showing a sea overflowing with plastic and other garbage at Manta Point, a well-known diving site near Bali’s main island, has highlighted trouble in paradise. The holiday island has become an embarrassing poster child for Indonesia’s trash crisis. 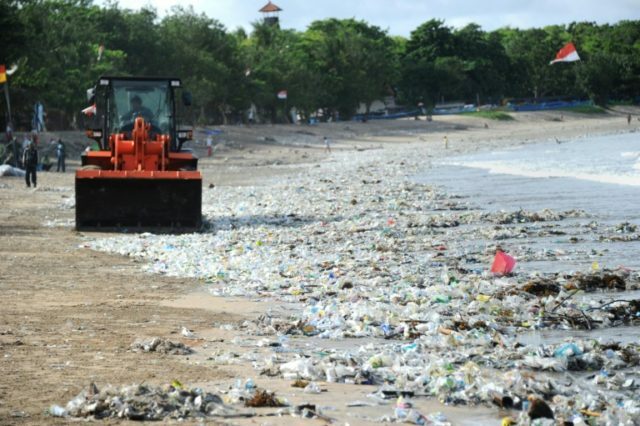 The problem has grown so bad that officials in Bali last year declared a “garbage emergency” across a six-kilometre stretch of coast that included popular beaches Jimbaran, Kuta and Seminyak. “The ocean currents brought us in a lovely gift of a slick of jellyfish, plankton, leaves, branches, fronds, sticks, etc…. Oh, and some plastic,” the diver wrote on his Facebook account. His video, which has been viewed more than a million times, shows a diver swimming through a torrent of rubbish — including bottles, cups and straws — at Manta Point about 40 kilometres (25 miles) from Bali’s main island. “Plastic bags, more plastic bags, plastic, plastic, so much plastic!” Horner said. Indonesia, an archipelago of more than 17,000 islands, is the world’s second biggest contributor to marine debris after China, and a colossal 1.29 million metric tons is estimated to be produced annually by the Southeast Asian nation. The waves of plastic flooding into rivers and oceans have been causing problems for years, clogging waterways in cities, increasing the risk of floods, and injuring or killing marine animals who ingest or become trapped by plastic packaging. “Microplastics can contaminate fish which, if eaten by humans, could cause health problems, including cancer,” I Gede Hendrawan, an environmental oceanography researcher at Bali’s Udayana University, previously told AFP. Bali’s rubbish problem is at its worst during the annual monsoon season, when strong winds push marine flotsam on to the beach and swollen rivers wash rubbish from riverbanks to the coast. “It tends to accumulate (at Manta Point) and the very large amount of rainfall probably has increased the level of garbage because it’s all swept from the mainland out to sea by the rains,” said Iwan Dewantama, a researcher at NGO Conservation International. As part of its commitment under the UN Environment’s Clean Seas campaign, Jakarta has pledged to reduce marine plastic waste by 70 percent by 2025, through recycling, curbing the use of plastic bags, cleanup campaigns and raising public awareness. Still, the scale of the problem facing Indonesia is huge, due to its population of more than 260 million and poor waste processing infrastructure.